Neil Riding displays the medals he won at the Utah Special Olympics. 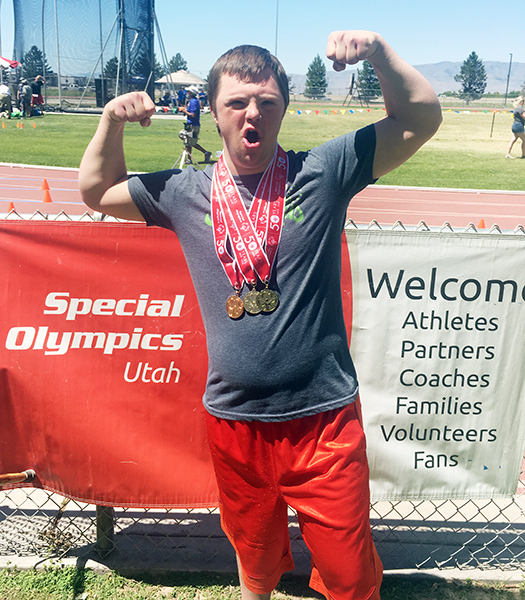 EPHRAIM— Ephraim native Neil Riding took two gold medals in this year’s Utah Special Olympics at Utah Valley University. The event, held June 8 and 9, drew more than 800 participants from all over the state. The Special Olympics give people with intellectual disabilities opportunities to compete in a variety of sports, including swimming, track and field and softball. Riding competed in four events, and took gold medals in the 25-meter dash and softball throw. He also took bronze in the 100-meter dash and fourth place in the 50-meter dash. He’s been competing in the Special Olympics for three years. He began playing basketball in middle school, high school and church teams. When he moved to Orem, he started running on a nearby middle school track. “He just got to be pretty fast,” said Margaret. The Special Olympics were first organized in 1968 by Eunice Kennedy Shriver, who saw that many children with intellectual disabilities were excluded from sports teams and other activities. The first event was held in Chicago, with about 1,000 athletes total competing. Fifty years later, over 4,000 athletes and coaches will be competing at the national level, with many more competing in state tournaments. Lexi Nielson maintains a positive attitude as she battles cancer. SALINA—As school draws to a close this week, many local kids are looking forward to summer to sleep in, hang out with friends and just generally kick back. Lexi Nielson, an eighth grader at North Sevier Middle School, is looking forward to it for a different reason. At the end of June, she will complete a grueling 38-week chemotherapy regimen. Then, if she’s blessed to get a clean bill of health, she might be able to think about normal summer activities. Lexi, 14, was diagnosed with stage 4 rhabdomyosarcoma, a very rare childhood soft tissue cancer, after finding what doctors initially thought was a cyst on her body. When the cyst did not respond to laser treatment, her Gunnison doctor referred her to Primary Children’s Hospital. After extensive testing, the doctors there came back with the bad news—it was cancer. Since that time Lexi has been in the fight of her life. “We’re just hoping for the best; we’re living day by day,” her mother, Kandice Nielson, said. Over the course of the last eight months, along with the chemotherapy, Lexi has endured three weeks of five-days-a-week radiation and a blood transfusion. She has good days and bad days, but she is doing remarkably well, her mom said. Lexi has mostly been unable to attend school over the months of treatment although she goes occasionally when she feels good. She has completed schoolwork at home as she has been able. Her class recently made a video of “Fight Song” to show their support for Lexi. Lexi generally stays home and travels to Salt Lake City weekly for her treatments. It’s a tough schedule for her and her mom—a single mom who has two other children, Ryan, 17, and Jake, 7. Along with caring for Lexi and her brothers, Kandice has been there for her own mother, Sandra Nielson, who was diagnosed with stage 2 lung cancer herself within weeks of Lexi’s bad news. Sandra has also undergone chemotherapy and had 60 percent of her right lung removed. A recent scan showed she is now cancer free. Kandice, who works at her mother’s daycare center, said it has been a tough road, but she’s enjoyed a lot of support from family, friends and the community. In February, benefit was held that many local businesses and community members donated to, bringing in some money to help with expenses. Family and friends also considered launching a GoFundMe campaign but had to abandon that idea when they discovered that doing so might jeopardize Lexi’s Medicaid benefits. If things go well, Lexi should be able to return to school in the fall. Since she was a 4.0 GPA student before being diagnosed, school officials feel she won’t need to repeat eighth grade and can move on with her peers, Kandice said. For now, the teen is staying strong for the remaining weeks of chemotherapy. She has a pretty philosophical outlook on the experience. Both Lexi and Kandice are hoping a PET scan at the end of treatment will give Lexi the “all clear” to resume her life. If so, she wants to spend time with family and friends, go camping and maybe even go shopping for makeup with her cousins. Looking into the future, she hopes to attend Southern Utah University and to someday be a model. A fund has been set up in Lexi’s name at Zions Bank in Salina. Contributions will not impact her Medicaid benefits. MT. 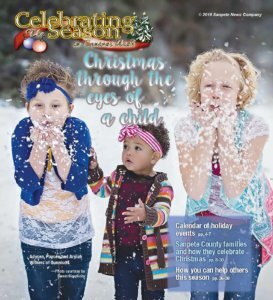 PLEASANT—A discussion about bullying in the North Sanpete School District (NSSD) may be a catalyst to help improve the district’s new behavioral program. At a board meeting Tuesday, May 15, Melody Brunson, a former teacher and vice president of Moroni Elementary’s Parent Teacher Association, shared her concerns about bullying. She has two autistic children. Despite her glowing recommendation of NSSD and its teachers, Brunson said one of her sons has dealt with bullying and harassment regularly, and because of his autism, she is deeply concerned that it will cause a ripple effect that leaves an impact all the way into his adult life. Brunson said she has read a number of studies, including one published in the Journal of Psychology, that say bullying affects children much worse than society previously thought. If that is the case, she believes bullying will affect autistic children even worse. She is worried it might mean they won’t live normal lives as they grow older. “My children should know they can go through school knowing their bodies are safe,” Brunson said. Brunson told the Messenger that a culture of bullying and allowing bullies to get away without consequences is something she believes many students deal with in the NSSD. She said that once she had a conversation with another mother whose child was in a local school. The mother told Brunson that her child would have told her if he had ever been bullied—that she would know. Upon returning home, Brunson said the mother asked her child outright if he had experienced bullying and the child told his mother “of course I have” and that he had been punched, kicked and harassed multiple times. Brunson says the mother was shocked and upset. NSSD Superintendent Dr. Sam Ray told Brunson at the meeting that the entire district is in the process of fully implementing a new behavioral program, and perhaps she could give some input during the process that would contribute to the program’s effectiveness in preventing problems with bullying. The new behavioral program, dubbed Positive Behavior Intervention and Supports (PBIS), isn’t really new—just new to the district—and this is its first year at NSSD. Before its rollout, each school had its own way of handling behavioral issues, said Chalyece Shelley, NSSD special education director and the person tasked with handling the PBIS implementation. PBIS gradually rolled out this year with the first tier. A consultant from the University of Utah is helping the district to institute the three stages of PBIS, said Shelley, and the district has been told that rushing its implementation process could be detrimental towards its success. Tier one is a district-wide set of rules and a system to support them, as well as a behavior tracking component that Shelley said will be able to help identify areas and individuals that need more support. Tiers two and three, which Shelley said will be rolled out gradually over the next year, will include a system to provide more individual attention to students who might be struggling. The second tier is meant to support those students who have difficulty staying within the system-wide rules instituted during the rollout of tier one. The final tier is only meant for application in special circumstances, said Shelley. It is tailored to support students who may struggle with special needs, aggressive behavior or have experienced trauma. She doubts that no more than two or three percent of the student population might ever need the support from tier three. Shelley said PBIS is about getting the whole district on the same page. The program is endorsed by the state and has years of statistics backing up the validity of its effectiveness. This is why the district made a move to bring it in, not because of addressing any out-of-the-ordinary behavioral problems. Shelley points to another factor that she thinks is a good indicator about the NSSD culture—one of long-term, continuous academic improvement. She said NSSD test scores in all the schools have been on the rise for a while, and there is no sign of stopping. “I don’t think cultures of violence and academic improvement can really co-exist,” she said. The Brunson’s children and the rest of the students in the NSSD should be able to benefit from this program, Shelley said. The district could have benefitted from putting it in place sooner. “We are very open to any suggestions you might have,” Ray told Brunson in the meeting. Ray added that he would have Shelley make a meeting with Brunson to get her input on PBIS. Shelley says within about another year, the behavioral tracking component of PBIS will have enough data backing it to give the district an idea of its local effectiveness. Only time will tell. EPHRAIM—Fire crews are controlling a lightning-caused fire on Sanpitch Mountain, located about 20 miles northwest of Ephraim in the Manti-La Sal National Forest. The fire burned for several days before being discovered. The fire was ignited by lighting on Monday, May 14. Crews only began actively managing the fire on Wednesday, May 16, and by Thursday, May 17, it had grown to 110 acres while under active monitoring by fire crews. The fire will be allowed to burn to reduce heavy fuels in the area. Crews will allow the fire to consume 140 acres as part of a controlled burn, the Forest Service stated. 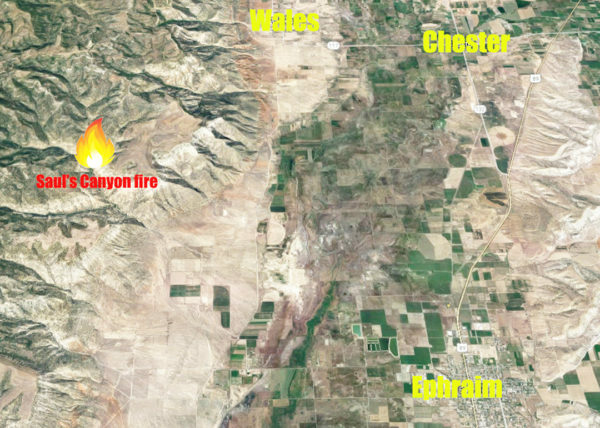 Illustration depicts the location of the Saul’s Canyon fire. Most of the fire is currently burning white fir and dead trees in Saul’s Canyon on the Sanpitch Mountain. Due to the high elevation of the fire, the Forest Service expects that smoke will be visible from I-15, Juab, Sanpete, and Sevier counties and will be seen for over a week. The fire is expected to last a few days. Spring vegetation has emerged and fire managers have decided that conditions are excellent for maintaining and controlling the fire. The managed fire can reduce the risk of wildfire by reducing hazardous fuels and aiding aspen regeneration. Beneficial fires restore and maintain healthy forests and rangeland, and improve wildlife habitat. The Saul’s Canyon fire managers will review the fire’s progress and weather forecasts to determine if the fire will stay in pre-designated boundaries and if resource objectives are being met. Fire crews will be monitoring its movement to assure the protection of life and property. If necessary, the fire will be actively suppressed, the Forest Service reported. 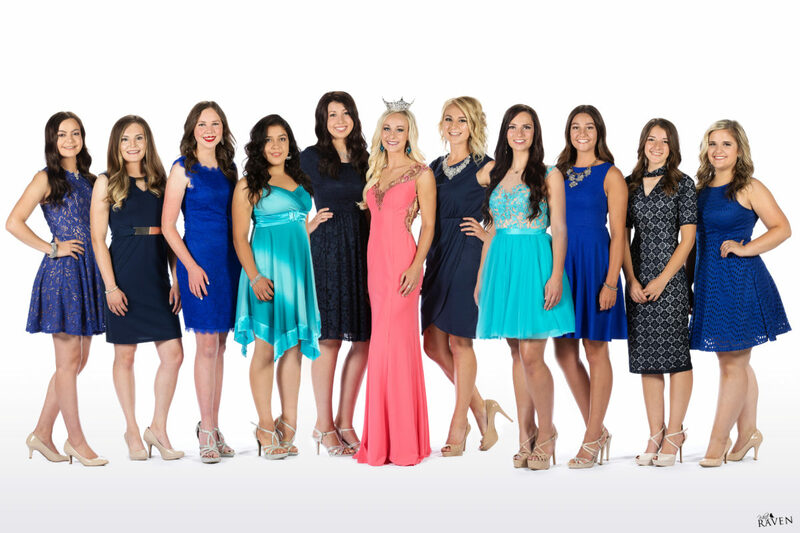 The ten contestants who will compete for the Miss Sanpete crown on Friday are (L-R): Ashytn Childs, Michayla Jackson, Lydia Madsen, Jasmine Alcala, Jillane Olsen, MIss Sanpete 2016 Kaytie Nielson, Senora Childs, Amelia Nell, Bellamy Sorensen, Makenna Cherry and Jordan Henson. MANTI —This year’s queen bee for the whole county will be chosen Friday at Manti High School when a new Miss Sanpete is crowned. 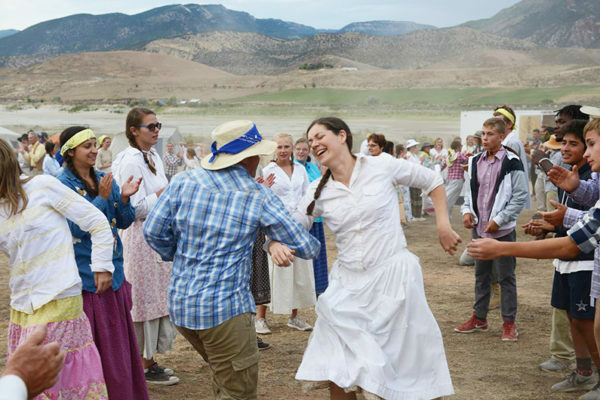 The new queen and her attendants will reign over the upcoming Sanpete County Fair. “I am so excited this year to have worked with some new young ladies and those with devotion and drive to come back and compete again,” said pageant director Emily L. Cox of Manti. 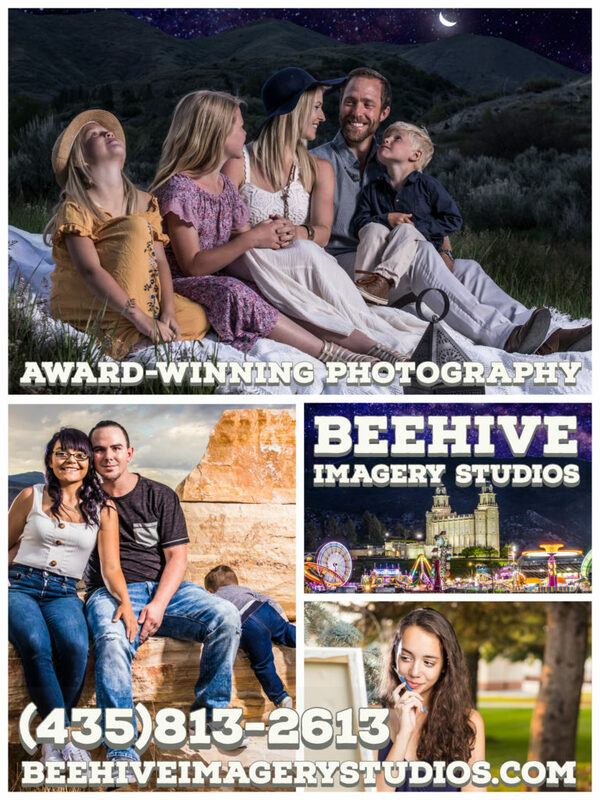 “We see contestants come and compete for many reasons, including a desire to serve within their community, experience personal growth and build upon the competitive spirit that can carry them to the Miss Utah Stage next June—and, most importantly, the scholarship. Cox says the new Miss Sanpete County will receive a $2,000 scholarship to the school of her choice to help further her education. Attendants receive amounts ranging from $200 to $500 to be applied towards college. The soon-to-be crowned Miss Sanpete also receives a $1,000 wardrobe allowance to help her compete at the state pageant, says Cox. There are 10 contestants in this year’s pageant; their profiles are below. Doors will open at 6 p.m. at MHS and adult tickets are $6, with tickets for children 4-11 years of age costing $4 and kids under four are free. Each adult ticket will receive a program with additional programs costing $1. Exiting the stage on Friday as the current Miss Sanpete will be Kaytie Nielson. 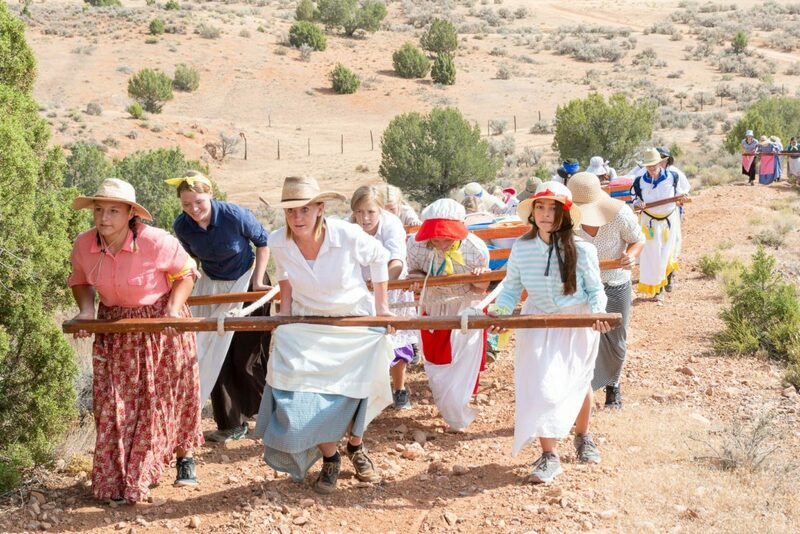 For more information about the pageant, please email misssanpetecounty@gmail.com, or contact Emily Cox at 435-851-0316 or Anne Fonville 801-362-1038. Cox says Jasmine’s platform is based upon growing young girls’ education, and finding ways to build self-esteem, and positive ways to cope that don’t lead to self damaging habits. “Michayla will focus on ways to honor who you are and the talents you have, “Cox said. Lydia’s platform, “Lend a Hand,” is all about encouraging service and leading by example, says Cox. Jillane Olsen, daughter of Scott and Melissa Olsen of Manti, will perform a piano solo to “Waterfall” by Jon Schmidt. Her platform is “Read to Succeed, “which will be an effort to raise support for reading across various age groups,” Cox said. Jordan is partnering with Autism Speaks to compete with the platform “4 Points of the Puzzle: Autism Speaks,” where she will try to advocate for the autistic and reduce social stigma, Cox says. Ashytn says she wants to encourage others to be themselves, no matter if they have a disease or disability. Bellamy Sorensen, daughter of Thomas and Candice Sorensen of Centerfield, is performing a self-arranged piano solo to “Can’t Help Falling in Love” by The Piano Guys and “Etude” by Kabalevsky. Her platform is “Unplug,” an effort to inspire others to back away from their devices and find some balance and moderation in their use. “Senora hopes to implement a platform that focuses upon having a club to celebrate and honor unsung every day heroes,” Cox said. 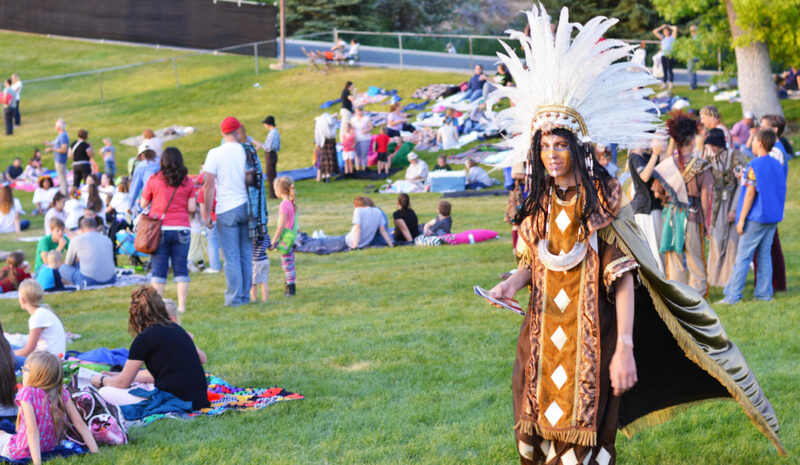 Both Pageant-goers and cast members mill around the blanketed seating area shortly before the beginning of the final night of the Mormon Miracle Pageant, which has increased cumulative attendance over last year—to the tune of more than 4,000 extra attendees. Official attendance numbers for the eight-night production was 74,805—up more than 4,000 people from the 2016 tally of 70,600. New Pageant President Milton Olsen says his first year had a happy ending, with loads of positive feedback from the attendees and cast members. Pageant-goers were not the only ones who were happy with the outcome, said Olsen. Time and time again, he said, the feedback from the cast of more than 900 was very positive—especially after overcoming some initial challenges. The new pageant director for 2017, Denise Hagemeister, says her first year as director also had its share of challenges and rewards, and in the end, it was very positive. Hagemeister said that the differences in her directing created some apprehension with the cast, and breaking some habits created from a 50-year Pageant tradition wasn’t always easy, but once the cast learned to accept her new direction and methods—and work with her vision—things went smoothly. Hagemeister says she had changes in mind for the pageant from the outset of her appointment as director. Having not grown up in Sanpete County gave her a different perspective on the pageant, and a desire to make some adjustments. Those adjustments didn’t happen overnight, she says, but when they did, it was rewarding. Hagemeister doesn’t solely credit herself for the successful implementation of changes to the pageant, however. Olsen says that he, and the cast and crew, learned some good lessons in his first year behind the wheel. “So much of what happens you just learn by going through the experience,” Olsen said. MANTI — The Sanpete Planning Commission moved forward with plans to re-organize the county ordinances regarding “buffer zones” around the Sanpete municipalities at their regular monthly meeting on June 14. Zoning Administrator Scott Olson and Commission Chair Loren Thompson had been working on a new definition of “buffer zones” for several months, and presented their handiwork to the commission for approval. Commissioner Gene Jacobson asked whether a city could deny a zone change in a buffer zone if it fulfilled county ordinances. Thompson assured him that the new definition only allowed the city to make recommendations after being given notice – the city would not have the authority to deny a zone change. Thompson went on the say that the definition was not final, either. It still had to go through a public hearing process, and receive final approve (after possible amendments from the Planning Commission) from the County Commission. After discussion, the new definition was approved by the Commission. Also presented to the Commission was a new form developed by Olson and Thompson, entitled “Sanpete County City Buffer Zone Application Notice.” Olson had taken that form previously used and made the form more definite on having the city comment on whether a proposed development would be in its annexation plans, and whether the roads or utility services would be adequate. Jacobson again questioned Olson and Thompson. He wondered if the cities would be given notice of this new form. Olson answered that the form would be used in every application within a buffer zone, and would have to be presented to the city. If any city had a question, it could call Olson as the Zoning Administrator. Jacobson wondered what would happen if the city refused to sign the form. Olson said that would not prevent the application from going forward – the form merely gave the city notice of the application within the buffer zone, and the opportunity to comment on it. A city would not have the authority to deny an application, either through its comment or through inaction. The new buffer zone application was also approved. After the definition and form were approved, Olson said “This does not end our buffer zone discussion.” Thompson seconded that sentiment. He pointed out that in the future, some coordination between city ordinances and county ordinances would have to take place, to account of the situation where an applicant in a buffer zone requested county approval where the city had requested changes that the applicant did not want to make. Thompson said that cities should have some say over how the development around their borders takes place, and this was especially true in the case of smaller, 1 and 2-lot subdevelopments. 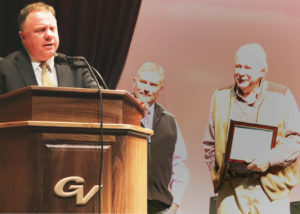 Commissioner Leon Day pointed out that continued approval of small subdivisions around cities would continue to frustrate annexation plans and stymy the cities’ growth.